The four-star Hotel Aqua Palace is north of the Piazza San Marco and within convenient walking distance of the Rialto Bridge. Its 30 rooms include doubles, triples, junior suites, suites, and rooms for disabled travelers. Wi-Fi is free. 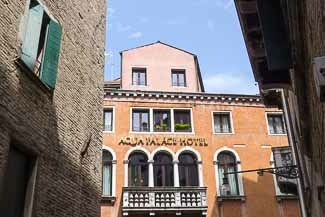 The hotel has an outstanding reputation, and--just as important--it has an attractive, peaceful location despite its proximity to Venice's tourist attractions and shopping. As you leave the Alilaguna airport-boat pier, turn right and walk along the waterfront. When you reach the Piazzetta (the large open area in front of the Doge's Palace), turn left and walk into the Piazza San Marco. Bear right as you pass the Basilica di San Marco and look for a street named Calle de la Rizza on the north side of the square, past the stone lions. Turn into the Calle de la Rizza, walk to the corner, and continue straight ahead into the Calle Specchieri. Follow the Calle Specchieri several blocks, past the San Zulian Church. Keep going until you hit a T-crossing with a large hardware store where you have to turn left or right. Turn right into the Piscina S. Zulian. As you walk down the stret, you'll see the Aqua Palace straight ahead of you, across a low bridge. Total walking time should be about 10 minutes from the Alilaguna boat station. Take the Alilaguna Blue Line airport boat from the cruise basin to the waterbus stop at San Marco Giardinetti.